Barely any international cricket to speak of for weeks and then they only sneak in the biggie. It’s India v Pakistan time again. It’s time to make flippant comments about players from both sides and hopefully get some vitriol in the comments. Even the biggest series has to be constricted these days, however. There are four days between the fifth one-day international and the first Test which should allow the players ample time to get their games adjusted for the longer format. If they fail to do so, it’s okay, because there are four days between each of the three Tests. Back-to-back? Hardly. Back-to-back means you only get three days off. Four days is a week in international cricket. Batsmen can overhaul their entire techniques in that time. Anyway, it was the first one-day international today. India won. Yuvraj Singh hit a fifty and so did some other people. We’re predicting an Indian series win. They’re at home and their seam-bowling seems the stronger, unusually. Without Mohammad Asif, Pakistan are a bit flimsy in the quick-bowling department. Shoaib could win a match, but he goes for a few when he doesn’t and what are the chances of his playing a part in the whole series? The man doesn’t even know that cricket’s played in series. He thinks you just play a one-off exhibition match every six months. Pakistan’s batting still seems overly-reliant on Younis Khan and Mohammad Yousuf as well, although we’ll be intrigued to see if Misbah-ul-Haq can inject some mature overachievement into the middle order, a la Mike Hussey. No Pakistani cricketer could ever be Michael Hussey. Its all about the Dna, and Pakistanis just can’t be that boring. I’m predicting great things from Robin Uthappa, so expect four consecutive ducks from him. I like that Robin Uthappa is well-accessorised. He always has a nice necklace on. Misbah-ul-Haq hasn’t given himself a ridiculous, self-important nickname yet. You can’t expect him to live up to Mike Hussey’s pompousness until he’s come up with something catchy for himself. We think it might be Andrew Flintoff and Brad Hodge who lay claim to the creation of ‘Mr Cricket’ as a nickname for Mike Hussey. We’ll proffer ‘Misbah Cricket’ as a complementary effort that doesn’t sound as good as it should do. Rod, Little Mr Cricket, David Hussey, seems to defy the Hussey DNA – maybe Misbah can defy his. p.s. 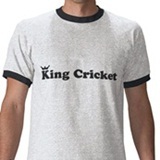 its also a chance to popularize the non-cricketing problems facing my country today.